Photography and videography related ponderings. I went out for a short bikepacking overnighter this weekend and thought it would be a good opportunity to test the video capabilities of the Olympus E-P2. I also took my first try in time lapse photography. I downloaded the CHDK firmware kit and the Ultra Intervalometer script for my Canon S90. After some initial problems and misunderstandings I got it to work (you just have to wait for the lens to be retracted in playback mode before you can start the enhanced firmware). 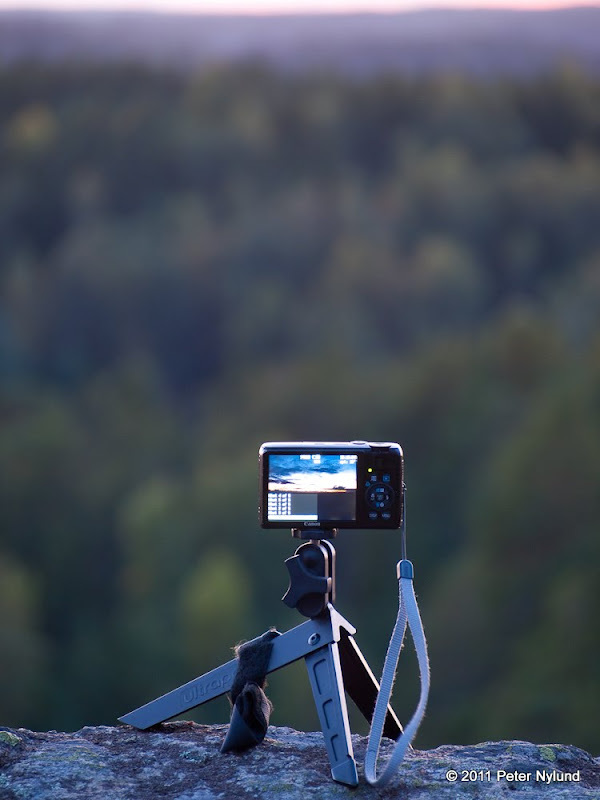 I took a small light tripod and put the S90 on it, pointed towards the sunset (and sunrise in the morning). The camera was set to take rather small 4 MP jpeg:s with a fixed white balance and exposure. The intervalometer was set to take one exposure every ten seconds. At home I used Lightroom to batch crop the images to 16:9 proportion and exported them as 1280x720 sized pictures suitable for the lower HD resolution which the E-P2 camera uses. The resulting image sets were then converted to AVI format using VirtualDub. I then ran the resulting AVI files through MPEG Streamclip to get a compression that did not cause visible moving color gradients. Finally I used Windows Live Movie Maker put together a movie from these time lapse clips and some other shorts clips I had filmed. The time lapses turned out fairly good, though I think the ten second interval was too long. Next time I'll have to try something shorter. There is also still a lot to learn about how to use the CHDK efficiently. The video quality of the E-P2 does not seem to far from that of the EOS 60D, despite the lower HD resolution. The actual resolution of the 60D video was probably quite far from 1920x1080. This time I only used the fully automatic mode when filming the videos, though the E-P2 should also allow fully manual settings. I will have to learn those as well. The Windows Live Movie maker does have some limitations: When including still pictures in the video, it for some reason gets rid of any sharpness pretty efficiently. It also does not allow exporting in the lower 1280x720 HD resolution, so I had to save it in the higher resolution, which does not make sense. A better video software would be nice, but currently I'm not doing enough videos to justify it. Really cool! BTW, CHDK is not yet available for my SX130IS, there is an alpha version but some users have reported permanent camera damage. © Peter Nylund. Travel theme. Powered by Blogger.